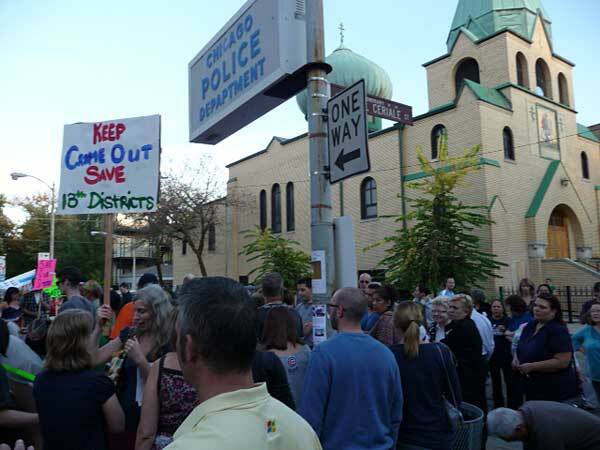 A Columbus Day rally on the Walton Street sidewalk of the 13th District police headquarters drew about 100 station-house supporters, including Ald. Proco Joe Moreno. The 1st Ward alderman suggested that renovations would build capacity in Mayor Rahm Emanuel's efforts to add beat officers in the 2012 city budget, which will be released Wednesday. "What I told the mayor is that our community, our ward, should not be penalized for our success," Moreno said. "If the plan is to close the station I'm against it. If the plan is to replace the station I support it." "The human capital housed here is so important," Moreno said. "Where are they going to go?" Later Monday the East Village Association board voted to support retaining the building at 937 N. Wood as an upgraded and viable station house. "You cannot have good safety without a visible police presence," said Anne Shaw, who organized the rally over the weekend amid persistent reports that the budget would mark the 50-year-old station for closing. Retired officer Julio Lucotti Jr. noted that neighbors had beaten back city officials' efforts to consolidate police districts in 1992. "They don't listen to me but they listen to you," Lucotti said. Volunteers circulated petitions to save the station house (an online petition has attracted 967 signers at this writing) and sample letters to city officials. A Sunday neighborhood canvass secured 150 petition signatures in an hour, Shaw said. During EVA's monthly board meeting at Leona's Restaurant, 1936 W. Augusta, president Greg Nagel asked for the board's show of support to meet the city's short time frame for budget comment. Neal McKnight, vice president and planning co-chair, acknowledged that EVA had sent mixed messages about the station's public safety role in its development position, which would commit the site to community benefit. An EVA vice president a decade ago, Shaw noted that the the group is playing a key role in educating neighbors on the potential shutdown. Eliminating the station would crowd its 200 officers into overcrowded quarters elsewhere, she said.